Korean-American violinist Elly Suh was recently awarded First prize at the 2016 Oleh Krysa International Violin Competition in Lviv, Ukraine and the 1st Grand Prix at the 2017 Concours International de Musique de l'Orchestre Philharmonique of Morocco, and previously was a prize winner in the Premio Paganini International Violin Competition, Michael Hill International Violin Competition, Moscow International David Oistrakh Violin Competition, and the Naumburg International Violin Competition. Suh has performed at the Salzburg Festival, Lincoln Center's "Focus Festival," Pro Arte Musical "Young Virtuosos Series," and has appeared on PBS's Live from Lincoln Center and NPR's From the Top. Suh has appeared as a guest artist with the East Coast Chamber Orchestra (ECCO) and the East Coast Contemporary Ensemble, and performed as guest concertmaster with the American Ballet Theatre Orchestra in New York City. 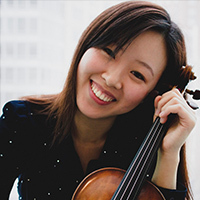 Born in Seoul, South Korea, Suh received her education from The Juilliard School and the Manhattan School of Music, where her teachers included Robert Mann, Joel Smirnoff, and Sally Thomas. Since 2015, Suh is a Postgraduate Diploma candidate at the Mozarteum University of Salzburg in the class of Professor Pierre Amoyal.